Looking to grow your business? Interested in maximizing your exposure and return on your investment? Advertise with Claremont Chamber with our easy and affordable options for any budget! $250 - Rotating AD for one calendar month. (200 x 200 px, at 300 dpi., jpg. & pdf.) May rotate every 5-10 seconds. $50 - Additional Category Listing - Increase your chances of being "found" in the Business Directory Search. Charge renewable each year. *All AD related graphics need to be received by the 15th of the month prior to AD run. AD must be in pdf. or jpg. format. $175 - Breakfast Sponsorship – 10-minute presentation, also includes one breakfast reservation, your information at each place setting and a display table. $175 - Ladies Luncheon – 10 minute presentation, also includes one lunch reservation and your information at each place setting. Village Venture - Annual event that attracts over 15,000 visitors who enjoy music, food and the arts. FREE Ways To Increase Your Presence! FREE - Become an Ambassador or join one of our committees! FREE - Become a volunteer at our Annual Village Venture Arts and Crafts Faire in October. FREE - Donate Raffle Prizes towards various events! Free - Bring flyers and business cards and place them on our shelves and tables inside the office. Free - Bring flyers and we will post them in our window. FREE - Member Testimonial published on our website. FREE - Post your events on our calendar and share them to our Claremont Chamber Facebook Page. FREE - Tag us on your post on FaceBook, Instagram, and Twitter. 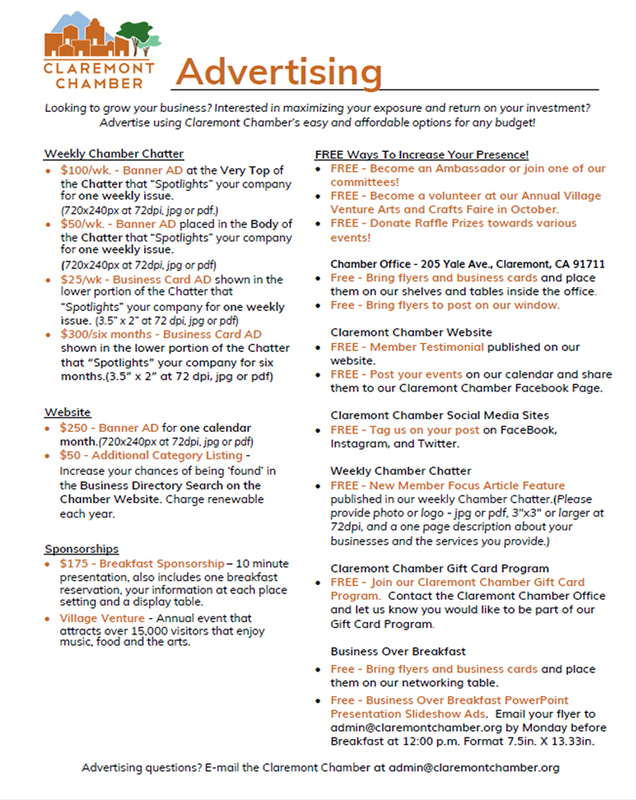 FREE - Join our Claremont Chamber Gift Card Program. Contact the Claremont Chamber Office and let us know you would like to be part of our Gift Card Program. We will add you to our List of Businesses that accept gift cards, provide you with flyers to put outside your business stating you accept Claremont Chamber Gift Cards, and more information about the program. Treat gift cards like cash. Bring them to the Chamber and we will write you a check for the amount of gift cards you have. There are no fees associated with this program. Don't miss out!! Free - Bring flyers and business cards and place them on our networking table. Free - Your flyers can be featured on our Business Over Breakfast PowerPoint Presentation. Email your flyers toevelyn@claremontchamber.org by Monday before Breakfast at @ 12:00 p.m. Preferred format for flyers: landscape, jpeg, 13.33 in. x 7.5 in.